Victor Puiseux's parents were Louis Victor Puiseux (1783-1858) and Louise Neveux (1792-1835). Louis Victor Puiseux was born in Paris on 23 June 1783 and became a tax collector. Let us explain what this job entailed. In France at this time there were indirect taxes on leather, tallow, starch, gold and silver items, and iron items. Louis Victor was an accountant whose job was to collect the taxes on these goods. He married Louise Neveux at Thiancourt on 12 May 1813. Louise, the daughter of Jean-Nicolas Neveux, a doctor in Pont-à-Mousson who had died in the 1790s, and Thérèse Husson, was born on 6 February 1792. Louis-Victor and Louise had three children, François Léon Puiseux born on 8 April 1814 in Jumilhac, Aquitaine, Victor Alexandre Puiseux the subject of this biography, and a daughter born in 1832 who died within a year. François Léon Puiseux studied at the colleges of Pont-à-Mousson, Metz and Henri IV in Paris, and entered the École normale in Paris in 1834. He became an historian and a professor at the Lycée in Caen. The Puiseux family moved to Longwy in Lorraine when Victor was only three years old, his father Louis-Victor being posted there to collect taxes. When Victor was four years old his mother tried to teach him to read but at first he refused to learn. His mother read him only the first half of various stories so that he had to learn to read to discover the way the plot ended. After some time when he continued to refuse to learn, saying he preferred to imagine the end, suddenly his attitude changed and he quickly learnt. From this time on was enthusiastic about learning. In 1826 Louis Victor Puiseux was posted to Pont-à-Mousson and his son Victor was brought up in that region of France. He attended the Collège de Pont-à-Mousson and while he was there his brother, who had completed his schooling in Paris and had just been accepted for admission to the École Normale, persuaded Victor also to complete his schooling in Paris. In 1834 Victor went to Paris and became a boarder at the Collège Rollin. This college was founded as the collège Sainte-Barbe in 1821 and renamed the Collège Rollin in 1830; it is now the Collège-Lycée Jacques-Decour on the Avenue Trudaine. At the Collège Rollin, Puiseux attended lecture courses by Charles Sturm on special mathematics. He worked very hard, his only recreation being long walks that he loved. He was also visited frequently by his brother who was by this time studying at the École Normale. While he was in Paris, he received news that his mother had died. She died on 17 February 1835, a few days after her 43rd birthday, from a chest infection. Puiseux's father asked his widowed sister-in-law Elizabeth if she would keep house for him and she agreed. They married two years later. Shortly after his mother's death Puiseux decided to stop boarding at the Collège Rollin but to continue studying there as an external student. He took a small room on the Rue Saint-Jacques. In 1836 Puiseux sat the Concours général, the most prestigious academic competition for high school students in France. He received the First Prize in physics in this competition and the Second Prize in mathematics. He was ranked fourth in the entrance examinations for the Naval College but turned down the offer of a place and sat the entrance examinations for the École Normale Supérieure. He performed outstandingly in these examinations but, being only 16 years old, he was not allowed to enter the École so had to spend another year in Paris. At this stage he was on his own in Paris since his brother had completed his studies and left the city. While a student at the normal school he took part in the religious discussions of the day, displaying strong convictions and a keen intelligence. He seconded the efforts of his friend and comrade in the school, Pierre Olivaint, founding with him a Society of St Vincent de Paul among the students and devoting a large part of his vacations to works of charity. His kindness, his charity, and above all his simple, unaffected modesty overshadowed even his talents. We note that Pierre Olivaint (1816-1871) entered the École Normale Supérieure in 1836 where he studied history. He later entered the Jesuit order. In 1840 Puiseux was placed first in his final examination at the École Normale Supérieure and spent another year studying in Paris. He took advantage of it to complete his mathematical training advised by world class mathematicians. He was asked at the same time to lecture to pupils of the École Normale Supérieure who had been his fellow students a few months earlier. They, for the most part, were older that him. He showed admirable qualities as a teacher at this time, displaying the talents he was to develop later in teaching courses at the Sorbonne. His thesis, Sur l'invariabilité des grands axes des orbites des planètes, thèse d'astronomie présentée à la Faculté des sciences de Paris, le 21 août 1841 Ⓣ, was on celestial mechanics and the stability of the solar system. In it he investigated questions which had been examined earlier by Laplace, Lagrange and Poisson. On 21 August 1841 he defended his thesis and was awarded his doctorate. From 1841 until 1845 Puiseux taught at the Collège Royal in Rennes. He had lots of free time and spent much of it walking in the countryside, enjoying nature but also thinking deeply about mathematics and mathematical astronomy. He appears to have been very sociable when in company but also enjoyed spending much time on his own. He remained at Rennes until 1845 when he was appointed professor of mathematics in the newly created Faculty of Science in Besançon. Another scientist appointed at the same time was the chemist Henri Étienne Sainte-Claire Deville (1818-1881) and Puiseux quickly became friends with his colleague Deville. It was at this time that he developed a passion for climbing, spending the summer vacations in the Alps mountaineering without a guide. During this period Puiseux published a series of more than ten papers in Liouville's Journal. He wrote on geometry, where he discovered new properties of evolutes and involutes and, mechanics where he studied the conical pendulum, the tautochrone and similar topics. On 2 October 1849 he married Laure Louise Fébronie Jannet at Versailles. Laure had been born at Valenciennes, Nord-Pas-de-Calais on 29 April 1830, the daughter of Jean-Louis François Jannet (1795-1861), head of the Lycée of Versailles, and Sophie Fébronie Joseph Wallon (1811-1892). Victor and Laure Puiseux had six children: Paul Louis Puiseux (born 18 February 1851, died aged 14 on 6 January 1866); Louise Marie Laure Puiseux (born 28 December 1852, died aged 21 on 11 May 1874); Marie Fébronie Puiseux (born 20 July 1853, died aged 18 on 31 March 1872); Pierre Henri Puiseux (born 20 July 1855, became a mathematicians and astronomer with a biography in this archive, died 28 September 1928); André Victor Puiseux (born 11 September 1857, died aged 3 weeks later on 1 October 1857); and André Paul Puiseux (born 22 November 1858, died in 1931). We note that Puiseux's wife Laure died on 2 December 1858, aged 28, as a result of child birth. At this time the family lived at 64 rue de l'Ouest. Sophie Jannet, Laure's mother, became a widow in 1861 and, having no other family, she helped out looking after Puiseux and his children. All admired the elegance, the clarity, the rigour, and the sobriety of his lectures. A difficult proof made by him on the blackboard was presented with such naturalness and simplicity that the good students wondered if they could not have found it themselves. His physical appearance was strange: a brush of red hair, dishevelled around the large forehead of a thinker, blue eyes extraordinarily sharp and brilliant ..., his appearance a little stooped, a certain embarrassment of his own person, an intimidating modesty; a voice a little shrill with a mellow lustre. He required respect from all: everyone always spoke to him with deference, did anyone ever dare to think otherwise of him? ... His patience and politeness were admirable. At that time, the pupils sometimes responded with absurdities when they were questioned about something they understood wrongly: Puiseux contented himself with saying in a very gentle tone: "I do not know if I have heard correctly, or if I am wrong, but it seems to me that what you have said is not entirely accurate." In 1850 he published his thesis Sur l'invariabilité des grands axes des orbites des planètes Ⓣ, written ten years before. Also in 1850 he published, in the Journal de mathématiques pures et appliquées, the paper Recherches sur les fonctions algébriques Ⓣ and, in the following year in the same journal, Nouvelles recherches sur les fonctions algébriques Ⓣ. 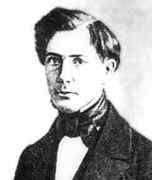 In 1853-54 he was acted as a substitute for Jacques Binet in astronomy at the Collège de France. From 1855 to 1859 he worked at the Paris Observatory where he was director of the Bureau des calculs. He replaced Cauchy, who was ill, giving the lecture course on celestial mechanics at the Faculty of Science in Paris in 1856-57. In 1857 he was appointed professor of mathematical astronomy at the Faculty of Science, having earlier taught courses there for Le Verrier after he succeeded to Cauchy's position. He also taught at the Sorbonne where he substituted for Charles Sturm and for Le Verrier. From 1868 to 1872 Puiseux held a post at the Bureau de Longitudes. His conscience was excessive; it was said that, struck by the singularly cruel mourning, he had come to the École, at the usual hour, in spite of everything, to fulfil what he regarded as his duty, and he had to turn away to hide his tears. Those who saw the tears of this man always in control of himself, so hard on himself, have retained this memory full of anguish. Soon after, the family moved to 81 Boulevard Saint-Michel, where Sophie Jannet also took an apartment. She died at the age of 93 in 1874. In 1867, now with four children, Puiseux went for the summer holiday to Switzerland, to the small village of Engelberg, in the Bernese Alps. In 1870, without André, they took their holiday in the Pyrenees and on their return in September they stopped at Lectoure, where Augustin Boutan (1820-1900), professor of physics and Headmaster of the Lycée Saint-Louis where Pierre and André were studying, had a holiday home. The French army had suffered defeats in the Franco-Prussian war and Prussian troops were approaching. Puiseux returned to Paris with his two daughters, leaving Pierre with the wife of Augustin Boutan in Lectoure. However, Paris came under siege by the Prussians on 19 September 1870 and conditions became very difficult. Puiseux, despite being 50 years old, was given a role in defending the city. His daughters suffered greatly during the siege and conditions continued to be very difficult after the armistice at the end of January 1871. Puiseux's daughter Marie became ill during the Paris siege and died from tuberculosis in March 1872. Around this time his other daughter Louise also became ill. She died in May 1874. Puiseux had attended courses by Cauchy early in his career and he soon became interested in research in the topics Cauchy was studying. He further developed Cauchy's work on functions of a complex variable, being the first to distinguish poles, essential points and branch points. He examined series expansions and looked at series with fractional powers. Although his work in this area was exceptionally good it became rather redundant after Riemann introduced the concept of a Riemann surface. After extensive calculations, Puiseux established in 1870 that the secular displacement of the ecliptic had no significant influence on the acceleration. Although a purely negative conclusion, Puiseux's finding led to a better delimitation of the problem, which was investigated by G Hill in 1877. Victor's son, Pierre Puiseux also studied the motion of the moon. He went on to become professor of astronomy at the University of Paris. More details of the Puiseux family can be found in our biography of Pierre Puiseux. The election was due to his merit, but its unanimity, to his character. We have already noted that Puiseux was a keen mountaineer but we should record that he was the first to scale an Alpine peak which is now named after him. He continued climbing, often with his sons, until 1879 when he realised that he was no longer able to keep up. As a last wish he requested that no discourse should be held over his body. His profound faith helped him to bear with resignation the death of his mother when he was only 14 years old, his devoted wife when she was 28 years old, and of four of his six children who all died before the age of 21. During the winter of 1882-83 he struggled to lecture because of his health, having to take a break for a while. He went to Nice to stay with his son André who was a deputy astronomer there. He returned to Paris, then left for Frontenay in August, staying with the family of his son Pierre's wife. He died there in the following month. Without meddling with anything, he meditated on everything. His mind resembled one of those powerful machines which, without straining or restraining itself, silently triumphed over any obstacle.